Can Increased Risk be Conservative? This article provides important guidance for conservative investors. It is especially important for retirees with limited or no sources of new income. It is a common belief that as a conservative investor, you should put your money in some of the most stable companies in the world: the largest stocks in the US . Many people go one step further, diversify and hold 500 of these through an S&P 500 Index fund, in order to reduce the risks specific to any particular company. In addition, some hold onto them for the long run, and avoid the big risk of buying or selling at the wrong time. Is this a conservative approach? This approach reduces many of the risks investors face today, but you can do much better! You probably heard that if you can afford to take higher risks you may benefit from higher returns by holding stocks of small and international companies. These companies are indeed riskier than the companies in the S&P 500, but if you hold them together in one portfolio, you may reduce your total risks. Yes, the Long-Term Component by QAM is an example of a portfolio that holds thousands of companies, some very risky when observed individually, and is significantly more conservative than the S&P 500. Let’s look at the 2000-2002 recession and recovery periods for the S&P 500 and Long-Term Component. All measures are striking and especially notable is the recession to recovery period. It took 6 years for the S&P 500 to recover, compared to 2 years for the diversified portfolio. The change in value of a portfolio is a result of the combined changes of its components. During the recession period, many companies in both portfolios declined significantly. Some went bankrupt. The key to the Long-Term Component’s success was lower correlation between the prices of the stocks in it. All companies in the S&P 500 are subject to the same risks common to large companies in the US . The decline in the US affected 100% of the portfolio. The long-Term Component is diversified in nearly 40 countries around the world, including large and small companies. Small companies tend to better diversify since they serve more local markets and are less affected by global events. Imagine two portfolios that each had the same returns with a 1 year offset between the two, a 2 year recession and a total decline of -14%. 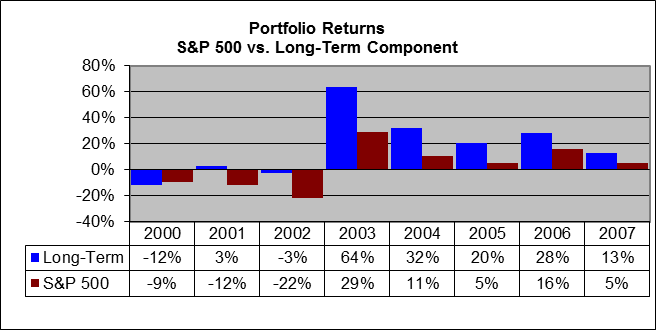 The following table shows the portfolio returns each year. When the portfolios were combined they had half the decline (7%) for half the duration (1 year), compared to the declines of each of the individual portfolios. This demonstrates how two portfolios with the same risk characteristics, but some difference in the timing of recessions, had much shorter and shallower declines, when combined together. Reduce risk or increase returns? Both! As demonstrated above, diversification can result in higher returns despite the lower risk. These high returns are a very nice benefit, but remember that the first priority of a conservative investor should be to limit the risk to acceptable levels. Only within these constraints you should try to maximize your returns. Diversification should be practiced even if the returns where not higher. The higher returns are a benefit of the diversification, not a reason for it. Constructing a diversified portfolio that limits the risks to an acceptable level are a must for every investor, and especially for people with limited current income. Any portfolio considered should be judged as a whole and without letting emotions get in the way. Risky stocks, having low correlation with an existing portfolio, make the portfolio more conservative, while low-risk stocks having high correlation with the portfolio do not reduce the risks. To stay most conservative, you should include thousands of companies and avoid individual stock selection or market timing altogether (e.g. using index funds).